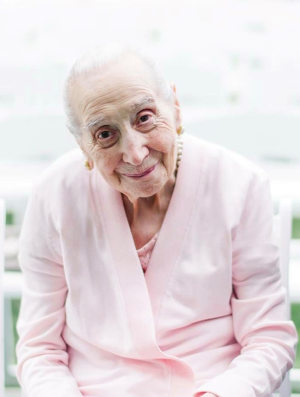 Rose Lucy Caleca, 97, died Saturday, February 2, 2019, at her home in Atria North Escondido. Rose was born in March of 1921 in Itri, Italy and moved to America as a young girl. Most of her adult life was spent in Fair Lawn, NJ and she spent the last seven years of her life in Escondido, CA being with family. Mrs. Caleca is survived by her son and daughter-in-law, Serge and Catherine Caleca of Escondido; and grandchildren Todd, Jenni, Valerie and Ross Caleca. As a loving wife, mother, grandmother Rose always led a life full of joy, happiness and devotion to those around her. As any Italian woman...love, home, safety and food were always staples she imposed on those around her. Rose loved to cook and eat a great meal. She found pleasure in watching her family grow and was a champion gin rummy player. "La nonna Rose sarà persa, ma mai dimenticata!" Grandma Rose will be missed, yet never forgotten.